Whether you’re renting your home, or you own it, one issue you are bound to have is the dreaded “slow drain.” Thankfully, this problem is typically nothing too serious, and you should be able to fix it on your own. Before you try to fix it, you should have a clear understanding of how your sink works and what is the probable cause for your sink or shower draining slowly. Once you understand the basics, there are a few key tricks that can help you unclog your drain, DIY style. What Type of Drain is Slow? What are the common causes for that particular drain? After those two things are figured out, fixing your drain should be a breeze. If your shower or bath tub drain is not working as well as it use to, the most common reason for this is hair. It doesn’t matter if you have short or long hair, if you give it enough time, the hair will build up in the pop-up assembly of your shower/tub drain and cause it to drain much slower than normal. If this isn’t taken care of, your hair will soon trap other sorts of debris which will eventually lead your drain not draining all together. 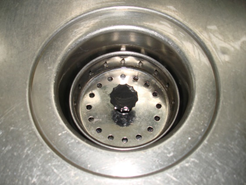 The most common reason your kitchen sink would not be draining will be food related. One of the biggest culprits is grease that gets trapped either in the P-trap, which is the curved section of your drainpipe that is located under your kitchen sink, or the drain basket itself. Food itself can get stuck in the bottom of the P-trap and hinder waterflow. Not only will this problem be inconvenient, but it can also get smelly. Its important to know that just because your drain is draining slow, doesn’t mean that the problem is right at the surface. You should also be well informed about how your venting and sewer lines function, and what the signs are of a malfunction. These are the main lines that will carry your household waste water and sewage away. One of the biggest things that can mess up your sewer lines is tree roots. The tree roots are attracted to all the nutrients that flow through these lines, and the roots will find any weak points, cracks or holes in your sewer lines. They will push their way into the pipes, rendering them useless. 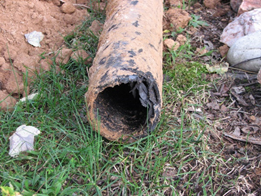 Its also important to know how old your pipelines are, because another common cause for sewer line problems is that they have begun to collapse or deteriorate. One big red flag that is indicative of a sewer line problem is if your toilet constantly clogs or flushes slowly. Vent stacks are an important part of your plumbing because they allow air into your pipelines, reducing the vacuum effect that would restrict water flow. These stacks are in your bathroom and kitchen areas around your house. 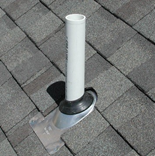 Typically, vent stacks are the pipes that are protruding through your roof. The most common reason they get clogged is by leaves, sticks and sometimes bird nests. There are several things that you can try before calling in a professional to come and fix it for you. Just remember to clear out any standing water in your sink or tub before you try to move the blockage, as the water will get in your way. This is going to be your cheapest way to try and fix your draining problem. 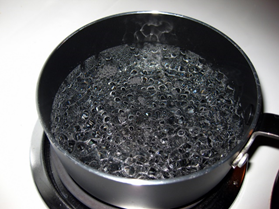 With this method, all you have to do is boil some water on your stove, make sure that there is little to now standing water in your way, pour the hot water into your sink and wait. You may have to repeat this process, but if the clog is small enough, this should move the clog along and out of the way. 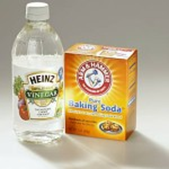 For this method, you poor about a cup of baking soda into your drain. Next, pour the same amount of either white or apple cider vinegar down the drain. This combination will bubble initially, then it will calm down. Once this happens, put the stopper in your drain and wait for about 15 minutes. After that time frame, run hot water to see if this cleared the clog. It is a good idea to invest in a designated sink plunger, if you can’t fix the clogs with the previous methods. 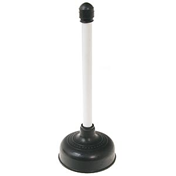 You can use a sink plunger on either a single or double sink. If you have a double sink, first seal off the second side with either a wet cloth or a stopper. To properly plunge your sink, you will need fill you sink up with enough water to cover the bell of you plunger. Then all you must do is plunge it like you would a toilet. If this works, you should hear the suction clear the clog, remove your plunger and run warm water for a few minutes. This tool, also called an auger or plumber’s snake, can clear the clogs that might be stuck deeper in the system. You simply stick this down the top of your drain until you feel something stop it, which is probably the clog. Then you twist it around until you feel the obstruction loosen. If the clog is even deeper, you will have to take apart your drainpipe and P-trap. While DIY fixes save money, they do not always work out. If your DIY fails or if you just do not have the time to track down and fix the slow drain issue, we can help. Contact us today. We can help you get your drains flowing smoothly in no time!